← Isis and Nephthys in the Mourning Rite of Ancient Egypt. 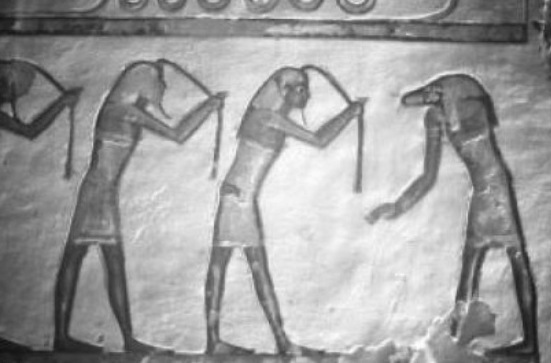 Hair and Death in Ancient Egypt: Pulling Hair also in the Hereafter. “Oh! The one who mourns, big of lock syt and of strong cry in the West protect the king. “Oh! These nein gods that mourn for Osiris, that cry for that one who is in front of Amduat. Oh, look at me! I am walking towards you I pass by your caverns I call you and you scream to me. Duaty, he feels happy with your voice, those ones who mourn in Duat, the ones with secret faces, under you lock of hair syt, your voice is for me. I call you together , I light you up, mourners…you lead me and I walk towards you, I really protect your souls, I make you have my light, I take away the darkness that is on you…big mourners, having goods, you who are over the lock of hair syt in the land of the West . I walk on the ground I came from in my first birth”. The words syt and swt describe the front lock of hair the mourners pull. We find also the term syt in The Coffin Texts in chapters 799 and 532, where tells about « tying the lock syt in Heliópolis the day of cutting the samt » and in several documents from the New Kingdom we also can read how a male characters are the mourners of Re and hold their lock of hair syt/swt they grant that Osiris can be justified in the Hereafter . At this point it is also interesting to say that in the chapter 339 of the Coffin texts, the day of the resurrection of Osiris is the day of “shaving the mourning women”. Again, also in the Hereafter, the nwn m gesture is a part of the mourning rite, as a sign of pain but also as a way of making the dead revive and make easier his way in to the Hereafter.
 . Piankoff translated the preposition as “carrying” the locks syt. But the first meaning of that preposition is “under”. If we take the sentence as “under the locks of hair syt” it made sense with the previous expression: “of secret faces”, so, “hidden under the hair”. The light comes after the darkness of the death. Mourners guide the dead with their screams. The deceased is blind (dead) and on the way to the new light (new life). Piankoff and Jacquet-Gordon, 1974, p. 55, Pl. 10. Berlin Papyrus 6, Piankoff and Jacquet-Gordon, 1974, p. 57. This entry was posted in 02. HAIR AND MOURNING WOMEN and tagged ancient egypt, Book of Caverns, dead, death, deceased, egypt, funerary, hair, hieroglyph, Isis, lock of hair, mourn, mourner, mummy, Osiris, Renni, resurrection, revive, tomb. Bookmark the permalink.